Mmmmmm cheesecake! I'm kind of known as the cheesecake girl and am inclined to make one whenever I'm asked to bring dessert. I made this for Easter Sunday and it was the perfect finish to a lunch of gorgeous roast lamb. 1. Preheat oven to 180C. Boil a large jug of water ready to use when baking. 2. Combine crust ingredients in a food processor and process and press into your preferred pan. You can press the crust just into the bottom, or up the sides of the pan too - baker's choice. Set crust aside. 3. Saute the apples, butter and brown sugar together over medium heat until tender and caramelised, approx 10 minutes. Set aside to cool. 4. Combine topping ingredients in a small bowl and stir to combine. It should be rough and lumpy. If it is too smooth leave in the fridge until you are ready to use and then roughly break up the pieces. 5. Combine cream cheese and sugar in the bowl of a stand-mixer and cream together until smooth. Add eggs, one at a time, fully incorporating each before adding the next. Make sure to scrape down the bowl in between each egg. Add heavy cream, vanilla, lemon juice, spices and apple juice concentrate and blend until smooth and creamy. 5. Pour half the batter into prepared crust and top with the apple slices. Pour over the remaining cheesecake batter and tap the pan on the counter a few times to bring all air bubbles to the surface. Place pan into a larger pan and pour boiling water into the larger pan until halfway up the side of the cheesecake pan. If cheesecake pan is not airtight, cover bottom securely with foil before adding water. 6. Bake for 20 minutes then remove from the oven and sprinkle over the crumble topping. Return to the oven and bake for a further 25-35 minutes until it is almost done - this can be hard to judge. 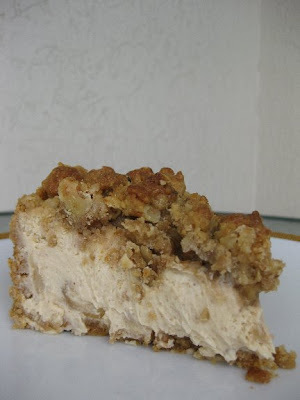 The crumble topping will be firm and golden brown but there will still be a jiggle in the cheesecake underneath. You don't want it to be completely firm at this stage. Close the oven door, turn the heat off, and let rest in the cooling oven for one hour. This lets the cake finish cooking and cool down gently enough so that it won't crack on the top. After one hour, remove cheesecake from oven and lift carefully out of water bath. Let it finish cooling on the counter, and then cover and put in the fridge to chill. Once fully chilled, it is ready to serve. YUM!!! This was a near perfect cheesecake experience. My only gripe would be that the ratio of creamy cheesecakey goodness to crust/topping was a little off. Next time I would make this in a smaller, deeper pan so each piece was a little more balanced. Thanks to Jenny for a fun and easy bake this month! Wow, that looks fabulous. 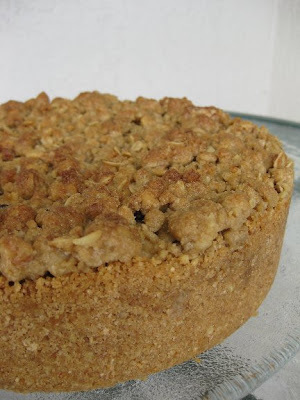 Then again, I think the cake : crumble ratio was just perfect :) I love crumbles. Lamb and cheese cake. I would be giddy with anticipation. I love the crumble on top. It looks delicious. Oh my... I almost just licked my screen. This looks fantastic!! Yum, this sounds so good, and what a perfect centerpiece for easter. Thanks for being a part of the April Daring Bakers Challenge! This looks fabulous Susan!! Great flavour choice. Just wondering if this is super sweet? I'm going to try it on Friday! Hi Marika, this is a pretty sweet cheesecake but the apple and spices do balance it out nicely. I would suggest using only a very thin scattering of crumble topping. Hope you enjoy it!